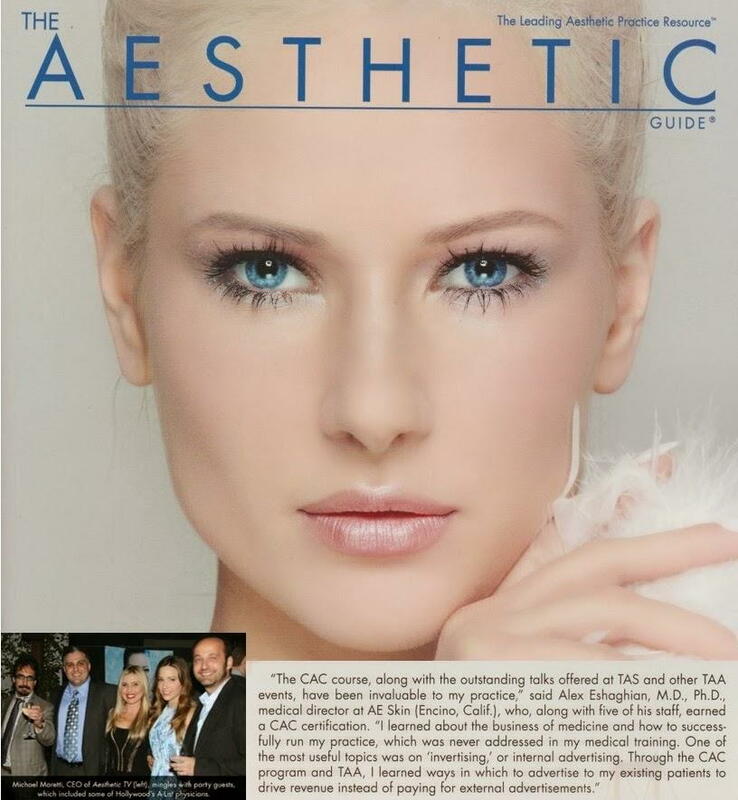 Dr. Alex is featured in the Winter issue of The Aesthetic Guide, the leading aesthetic practice resource for cosmetic doctors. One section featured Aesthetic TV’s Red Carpet Hollywood Mixer, where Dr. Alex was interviewed on the Red Carpet and spent time with other Hollywood A-list physicians such as Dr. Andrew Ordon from the television show The Doctors. The other section that featured Dr. Alex was an article entitled “The Aesthetic Academy Trains Elite Certified Practices.” One part of the articles discusses the Certified Aesthetic Consultant certification course. This course develops doctors and their staff to create outstanding practices. Dr. Alex has gained invaluable experience from attending the Aesthetic Show in Las Vegas, NV for the past three years as well as The Aesthetic Academy in Los Angeles in 2012, where A E Skin won Best Aesthetic Practice. Dr. Alex will be attending the Aesthetic Academy in San Francisco, CA February 15-16, 2014 with his office manager Nora. During this conference they will learn about lasers, injectables, and practice management. We look forward to the Aesthetic Show at the Wynn Hotel in Las Vegas, NV in 2014.